When the apocalypse hits there will be no tidal waves in Canberra, no cyclones, probably not even any flooding. Instead, there will be raging fire fronts, brown sludge in water pipes and the gradual, slow decline of the world as we know it. When the apocalypse happens and the ground is baked hard from sun and sap, the countryside will be filled with refugees from the cities and the limits of humanity will become strained and frayed. Only one question remains: can you face it? This is the premise of Eucapocalypts Now, a poetry performance written and performed by Canberra-based poets Ellie Malbon and Aaron Kirby. Held outside the recently opened Westside Container Village on Sunday March 22 as part of You Are Here Festival, Eucapocalypts Now painted a picture of the apocalypse as it will most likely be: a very un-apocalyptic, gradual and slow decline that is sometimes dramatic, sometimes mundane, but mostly just is. Following this was a series of poems – beautifully delivered by both artists – which imagined a localized apocalypse narrative. The stories intertwined and bounced off one another, running the gamut of human experience with tales of hardship and horror, beauty and love, hope and despair. I particularly liked the inclusion of small victories and the more mundane aspects of living in a changing environment: tap water running brown and the eager anticipation of germinating seeds. The inclusion of “place” was also well done, and the mention of the shipping containers just near the “old Floriade” really brought the tales close to home. The second half of the performance, when Malbon and Kirby invited the audience to reflect on their thoughts of what such a scenario would be like, was slow-moving at first. However, the pace picked up and some interesting and poignant points were raised. Whilst I liked the idea of audience engagement, I’m unsure if a facilitated discussion was the most effective way to do this. I also found the location, whilst effective in a place-making respect, had too many distractions and it was difficult to become fully immersed over the sounds of cars, machinery and scooter-riding children. Eucapocalypts Now was a great performance by two of Canberra’s best poets that provoked thoughts and stoked imaginings of an increasingly foreseeable future. Jess Oliver is a Canberra based writer, editor and curator with a penchant for words and shiny objects (literal and metaphorical). She also enjoys chocolate, books and red wine, and is a self-confessed ‘but why?’ person. 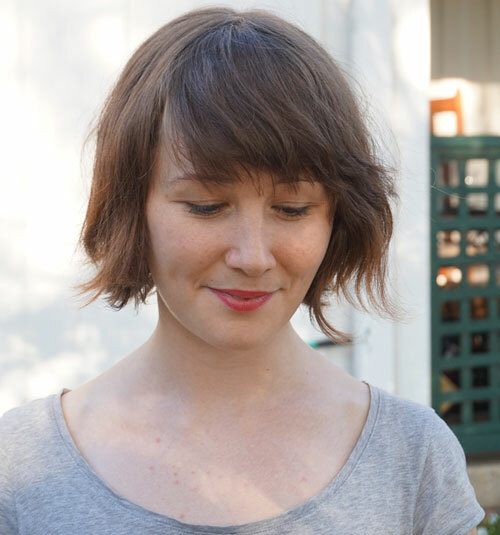 Jess has been Art and Theatre Editor for Lip Magazine and has written for Canberra’s BMA Magazine and rip publishing. She is the 2015 ANCA Critic in Resident, and has previously been an M16 Artspace Featured Writer.